Final fitting on Nick of Alice's artwork! Walking to the venue for field work with our sandwich boards! Headed to the beach - bandstand avoiding law enforcement on the boardwalk. Argentinian honeymooners ask for a photo with Diana! Field work done - hundreds of high-fives behind us. Does a free live performance event create a sense of affinity for Santa Cruz among people who happen up upon the event? People who happen upon a free public art event are more likely to outwardly express enthusiasm for Santa Cruz than those who came specifically for the event. (The site was the “band on the beach”, free Y&T concert on Friday night at Santa Cruz beach and board walk). 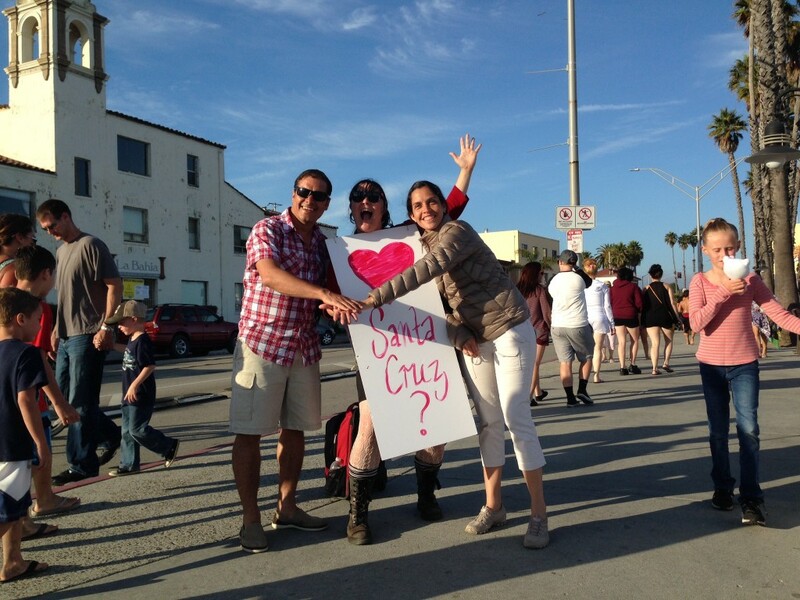 People willing to outwardly express enthusiasm for Santa Cruz when prompted. We measured by using two teams of two members each; one collecting data and the other hi-fiving. One group was situated at the base of the steps from the boardwalk to the beach and then moved around the periphery of the crowd on the beach. The second group was situated on the sidewalk on the other side of the boardwalk in front of the arcade where the band staging could not be seen. 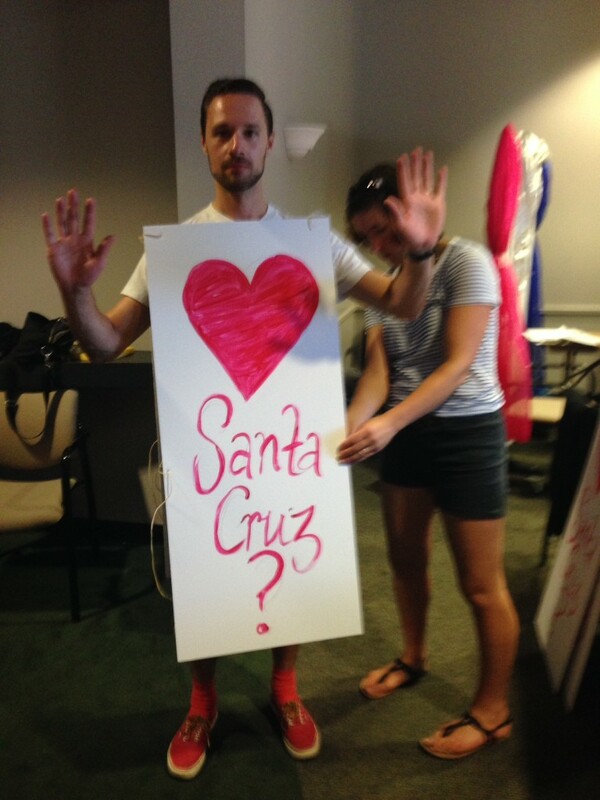 We planned to identify those coming to the concert intentionally, serendipitously, and those unaware of the concert and asking them to high five for Santa Cruz. 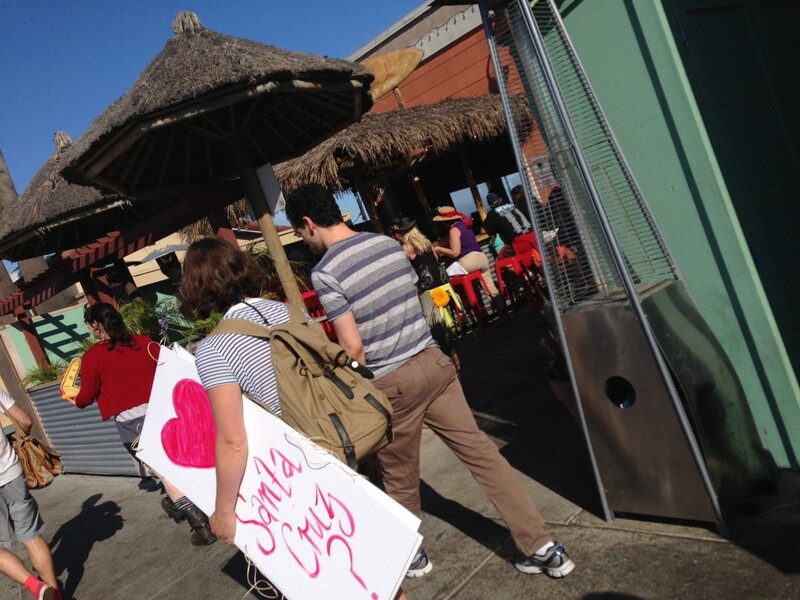 The researcher giving the high fives wore a sandwich board with ‘heart Santa Cruz?’ written on it front and back and then offered high fives’ to individuals passing. •	confirmation was established where possible by asking individuals if they had come to the concert and new about it before arriving at the beach. We were 90% confident that there would be a 15-25% increase in those that hi-fived who had arrived serendipitously versus those who had planned to come. Our sample size of serendipitous concert-goers was smaller than anticipated, but they were more likely to high-five when prompted overall. But not by as much of a margin as we guessed. People coming the concert with intention were very likely to show affinity for Santa Cruz with a high five - many were quite likely to add emphasis with their statements too. 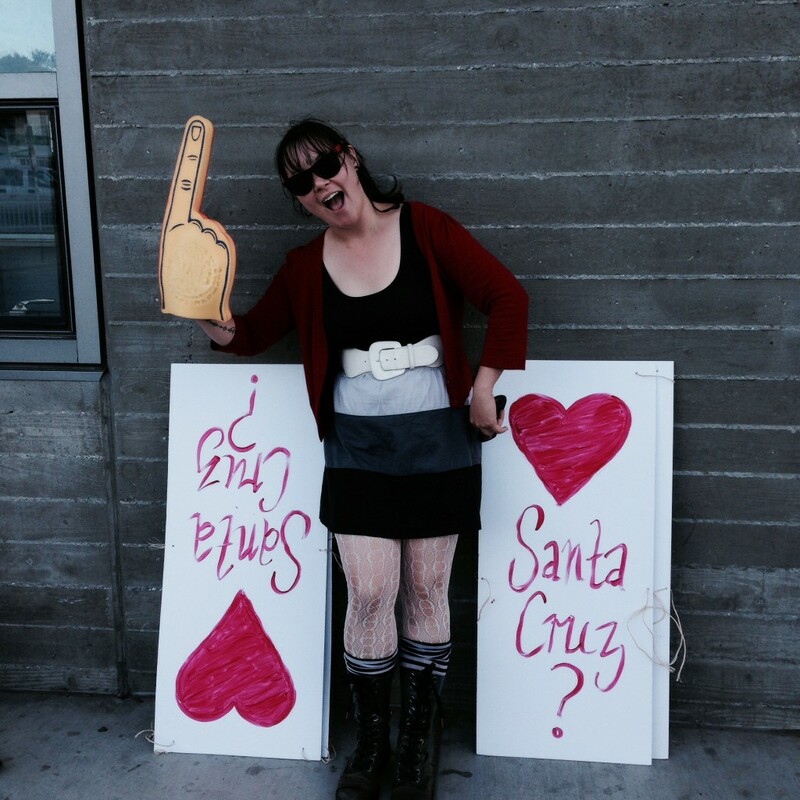 Many locals are very proud of living in Santa Cruz. 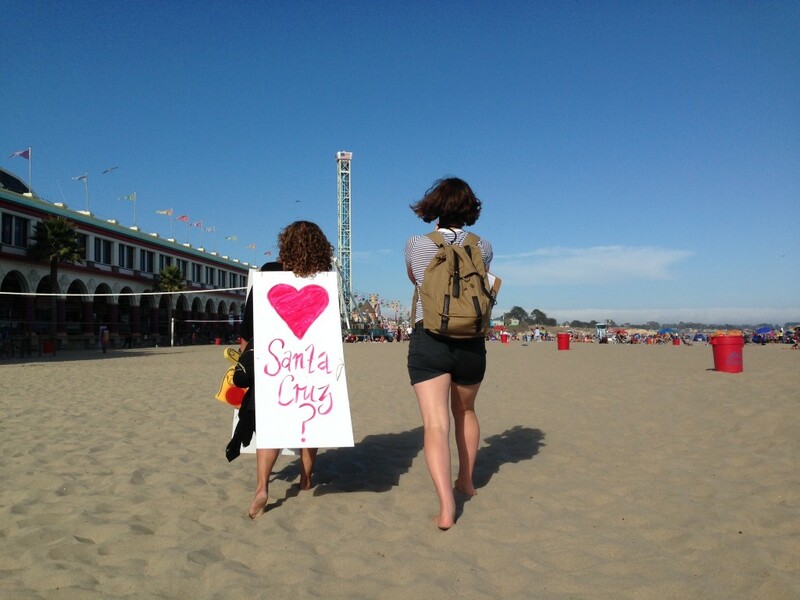 We heard a lot of "of course we love Santa Cruz, we've lived here for # years!" There were quite a few folks we met that don't even live in Santa Cruz but visit often especially for the Friday night bands. "We can't afford to live here, but we come every Friday!" One of us had 1 person give us the finger. Totally wasn't expecting that! People really love the free Friday Night concert series. They were really really happy to be there and many come every year, or even every week. This seems to have made the people who came intentionally much happier to be there and feeling affinity for Santa Cruz than we anticipated.